You feed them, take care of them and the day you miss bringing them lunch they bite the hand that feeds them. They stole all our Grimes Golden apples which, by a twist of fate, were the same size and color as the black walnuts growing next to the tree. Normally, I see my wife running after the squirrel with an apple in its mouth in August, not July. Sorry for the people who expected a post on “cayenne pepper sprayed on apple tree” – there is nothing to spray anymore. Arrgghhh! We haven't had to deal with this issue as of late due to the family of hawks that have moved into the neighborhood. I feel your pain though. My condolences. Maybe Karen will send you a hawk or two to help solve your problem, Nicholas. A hungry fox might be of benefit too. Let's call that sustainable pest control. 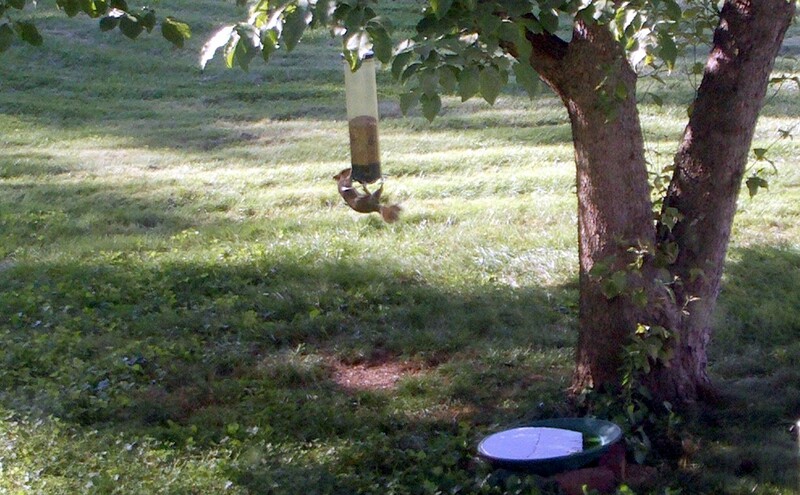 There's a bird feeder that doubles as entertainment and is specifically anti-squirrel. It has a wheel that is great for birds to sit on, but when a squirrel gets hold of it, the thing spins around until the squirrel flies off. Hilarious to watch and very effective. You can almost hear the birds laughing, too. Ditto. We usually lose some apples to the squirrels, but this year they're stealing them earlier than usual. I don't think we'll have any left to pick this fall.